Safe pasture. It sounds so inviting--and it is, for ordinary Christians and church leaders alike. If you're a pastor, safe pasture is what your sheep long for more than anything. And if you're a Christian whose church involvements and experiences have left you feeling curiously empty, you know how gladly you'd trade it all for a place where the grass really is greener ...where relationships with fellow believers are deep and restorative ...where worship flows not from techniques, but from hearts communing with God ...where the gospel's promises aren't carrots on a stick, but experienced realities ...where Jesus, the Great Shepherd, shows up in transformative ways that the corporation-CEO approach to church just can't produce. Sound too good to hope for? Glenn Wagner has wonderful news: Safe pasture isn't just your desire--it's God's. It is, and has always been, his vision for the church. Somewhere in our obsession with the big and impressive, with results-driven infrastructures and top-to-bottom ministries, we seem to have lost sight of this. But God wants to help us reclaim the kind of church where sheep aren't merely produced, but thrive in every way. effectively--you've already been there and done that. Rather, this profound book will reorient your whole concept of church: the things that really matter and the things that really build hearts and lives. In part one, you'll go in search of safe pasture and examine what church really is. In part two, you'll take a long look at what happens in safe pasture, where people exhausted by the religious fast lane find rest, where grace and growth replace sin-management, and where God's presence energizes true, rich Christian community. In part three, you'll gain insights for the central, burning question: How can we create safe pasture? 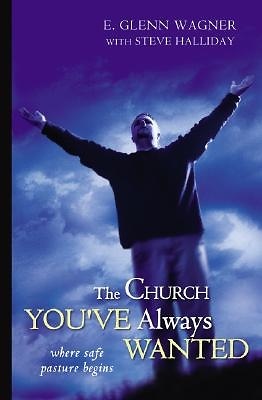 Filled with true-life illustrations and ringing with passion, this book is destined to become a spiritual polestar for pastors, leaders, and everyone with a heart for God's church. Cutting through conventional wisdom and traditional assumptions, it points the way home to the church all of us so deeply desire.